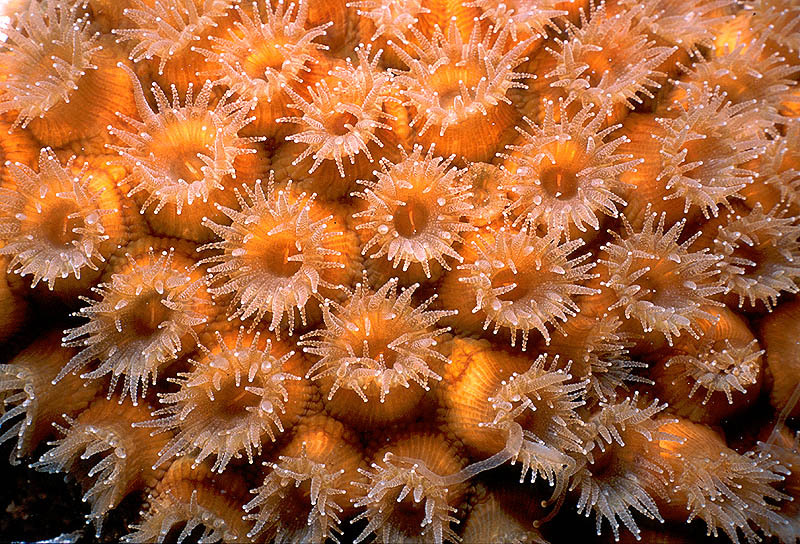 Coral reefs would be nothing without corals. So it is great to see healthy colonies of corals on some reefs in the Caribbean. The corals in this picture were very healthy. And these corals were huge, for corals, that is. This picture shows tiny animals called Great Star Corals. Each animal is one orange tube, about as big around as a nickel (about 1/2 inch) and about as tall as they are wide. Each animal reaches out into the water with a ring of short, white tentacles, hoping to catch food as it floats or swims by. In the middle of some of the rings of tentacles you can see a slit that is the animal's mouth. The tentacles are lined with tiny white dots that are stinging cells called nematocysts. As we've learned in other ReefNews web pages, each animal is called a polyp (say, "PAH-lip"). Each polyp will reach out into the water and sieze its prey with its tentacles. The stinging nematocysts will kill or paralyze the prey, and then the polyp will drag its prey into its mouth. What kinds of prey might these corals eat? Well, we watched them eat worms! Click here for a picture of Sea Whip Coral polyps eating worms at a reef near San Salvador. These coral polyps only come out at night. By day, they hide down in holes in their skeletons. Click here to see a picture of Great Star Corals in the daytime. This picture was taken just after sunset at Charlie's Reef near the island of Cayman Brac. ReefNews photographer Jonathan Dowell took this photo using a Nikonos V camera with a 28 mm lens and a 1:2 macro extension tube with a Nikon SB 105 strobe. NO CORALS WERE HARMED TO MAKE THIS PHOTOGRAPH. Jonathan was extremely careful not to bump into the coral polyps with the camera or the extension-tube framer, as any little bump could crush and kill these fragile animals. He found a bump on the surface of the coral skeleton, so the polyps would reach out into the framer without having to touch any of them. This picture and story first appeared in e-ReefNews, Vol. 5 No. 4.